Story of Victor Frankenstein, a young scientist who creates a grotesque creature using combination of chemistry, alchemy, and electricity. Begins with explorer Robert Walton looking for a new passage from Russia to the Pacific Ocean via the Arctic Ocean. 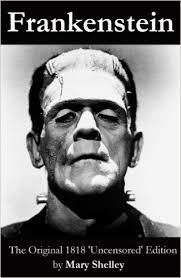 After weeks as sea, his crew finds an emaciated man, Victor Frankenstein, floating on an ice flow near death. Walton retells Victor's story in a series of letters to his sister in England.